Shows currently include the five pieces that are on the new CD - originals penned by Ochs, Adams, Cline and Amendola - plus other pieces by Raskin and the late great John Coltrane. Nels Cline (the guitar wizard who has breathed new life into alt-rock band Wilco) consistently ignites the stage in collaborations with Rova members, most notably during his many performances with Orkestrova's Electric Ascension (Rova's reworking of the John Coltrane classic Ascension) and the Yo Miles! Fillmore shows of 8 years ago. 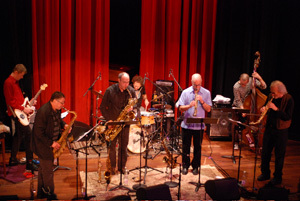 The septet is always available for festival and large theater appearances, given enough notice. Due to the busy individual schedules involved, extended tours are not currently planned. The Nels Cline Singers , ironically, are an all instrumental trio featuring Nels Cline, guitar; Trevor Dunn, bass; and Scott Amendola, drums. They formed seven years ago when Cline, ready to start another trio after the disintegration of his original one, was urged by Amendola to find a way to play more music together. Together they create a raw yet disciplined palette of sounds that draws from a wide range of sources. In this context Nels Cline has successfully reconciled his multi-directional passions into a music that can embrace elegance, wildness, drama, technical poise, and skillfully deployed electric noise. The Singers formidable instrumental mastery drives Cline's spunky and thoughtful compositions with passion and seamless energy, delivering music of rare beauty.